Random Thoughts – CREATE. PLAY. TRANSFORM. The beginning of the week is always exciting at the pottery studio. It’s when I arrange the pots that are drying on the shelf and check them if they are all dry. I usually place the pots on my skin (arm and sometimes my cheeks) and check if they feel cold, which means they are not totally dry yet. Pots can’t be fired when they are not fully dry (bone dry). I am very thankful for the weather, as the pots get dry faster. But letting them dry too quickly can cause them to crack too. Pots are more fragile even before they go through the fiery furnace. Tomorrow, four huge buckets with scraps of clay are waiting to be recycled. 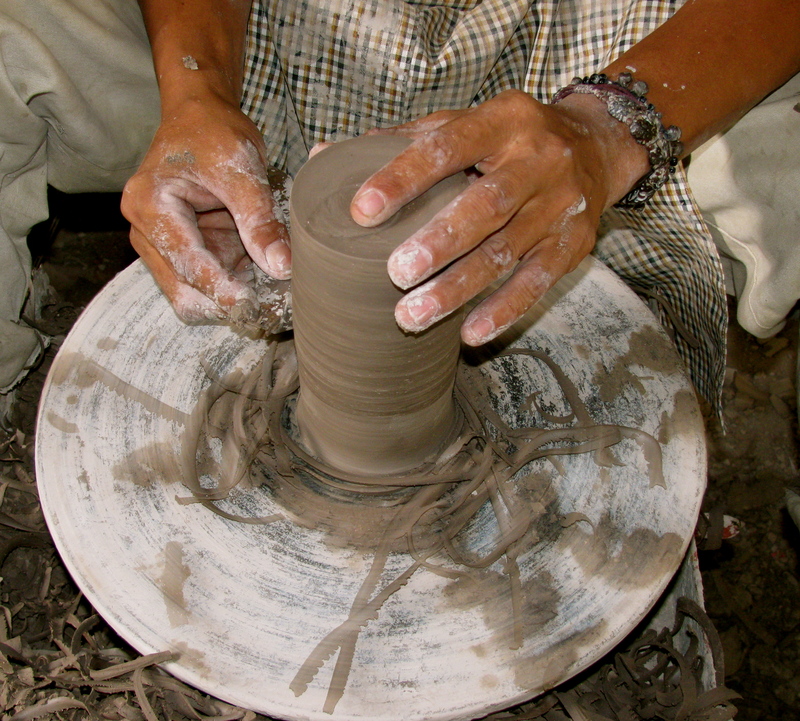 They come from the different sessions that are held in the studio: pinching, coiling, slab making, and wheel throwing. The bucket will be filled with water overnight. The fun part begins the next day, when the water will be siphoned out. This is where the muddy work comes in, more than forming the dry lump of clay by hand or with the wheel. Two hands will dig all of the melted clay. I can always ask someone to do this, but this process has been my favorite time to play with clay. It has become a time of prayer for me as well. Since I don’t have machines to recycle my clay, I do it the hard way. I would put the melted clay on plaster bats and let them dry until they are almost ready to be kneaded. I put all the heavy amount of clay on the floor and would step on it, barefooted of course. I have to make sure that there are no lumps, because it’s such a hassle to knead the material with them. 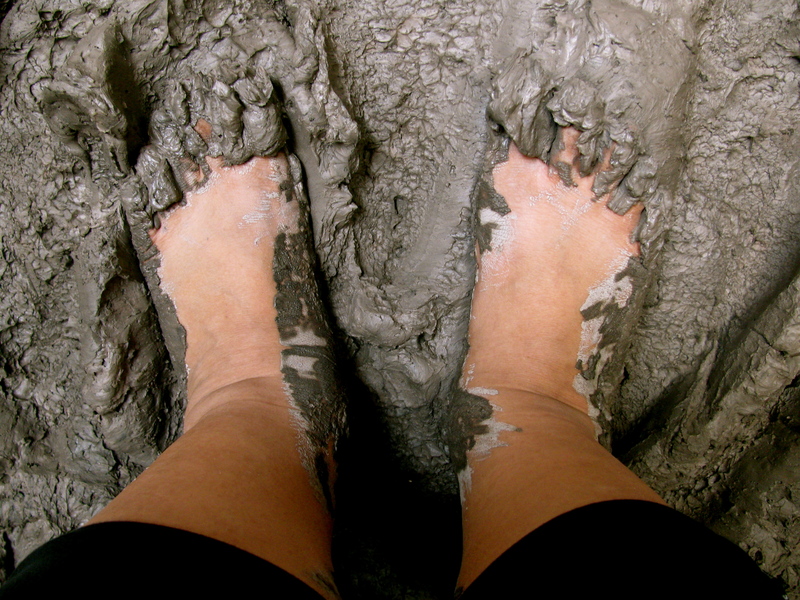 I am trying to stay away from carpal tunnel syndrome, so I would rather process my clay with my feet! A trip to the nail spa is how I would end a clay-stomping day. After stomping the clay, I get my shovel and gather all the clay to the center. This will make it easier for me to put them all back on the table, a few kilos of clay at a time! Who needs a gym membership? Definitely not me! The consistency of the clay is so much better at this stage. Sometimes it’s better than a newly processed clay that was never used. I take a break after bending and carrying all the heavy clay. After a glass of water and a few stretches, I go back to the table to knead them. It excites me to try two kilos of recycled clay with the potter’s wheel. I would then know if it needs an additional material to make it stronger like sand or grog. Sometimes, this is my form of prayer. No words, no sound, no laughter, no tears. Just watching a pile of wet dirt being brought back to life. Making sure that all of the scraps will be used again. Not for the same purpose, but will definitely become useful again. It gives me hope after I feel my body all tired and ready to collapse at times. Sometimes no words can explain how powerful the Master Potter is. It is in what I see in each process that makes my lips form a sweet smile. Sometimes with tears in my eyes after knowing that just like the clay, we will never be put to waste. Never to be thrown away, never forgotten, never taken for granted. I cannot wait to dig these hands into the four buckets filled with wet clay. Hope is there, love is there. I will dig until no clay is sticking on the walls of the buckets. I will stomp the clay until no lumps are left. I will knead the clay until they are all back in plastic bags. And I will kick the potter’s wheel until I see the recycled clay back to life. Monday. I look at my alarm clock and it tells me that it’s 6:00 AM. I toss and turn, wanting to sleep again. The sunlight from my window, which is right across my bed is so bright. Even if I want to sleep some more, the brightness in my apartment is simply telling me to wake up. This happens to me every single day. I have decided to put my bed facing the window, so I would wake up early. I love brand new days and how my days are not all the same. There are days when I would teach pottery making, forming my own pots, trimming them, firing the kiln, resting, reading, walking, etc. I have tried working in the pottery studio for one full week and found myself exhausted. My body almost screaming at me, “Give me a break!” Since I am still doing everything on my own, I give myself time to rest for at least a day or two in the week. I teach pottery making and assist at the Ceramic Studio at the University once a week. I prepare for work, and make sure that I have everything in my bag before I leave my apartment. I arrive in the studio a little early and enjoy the silence of the space. I sweep the floor and knead some freshly mixed clay. Students today are coming to trim their pots, after forming them on the potter’s wheel. I make my own works as I wait for them to come. Humming a tune as I kick the wheel. A few minutes have passed and they started coming. One of them is so excited and she showed me her trimming tools, which were purchased during her first pottery lessons with another pottery teacher. She brought out her wire loop tools for trimming pots. Both big and small ones. I feel them with my fingers and told her that they are still sharp. I showed her where her pots were, and she unwrapped them one by one. Letting the others dry, as she trims the pots she made first. She hops on the wheel and starts to trim, remembering her lessons in the past. I watch her as she trims. And I observe her hand position as she does it. She works well and can be left on her own, but she wanted me to be with her, so I sat right in front of her wheel. Sometimes we talk and laugh, but once I see her get into the rhythm of trimming her creations, I stop talking. We stop talking but as she trims her bowls, I can’t help but be encouraged by the process of trimming pots. To trim is to cut or remove unwanted parts. In pottery making, trimming pots are done, after they are formed on the potter’s wheel. It is done when the clay is in the leather-hard stage. 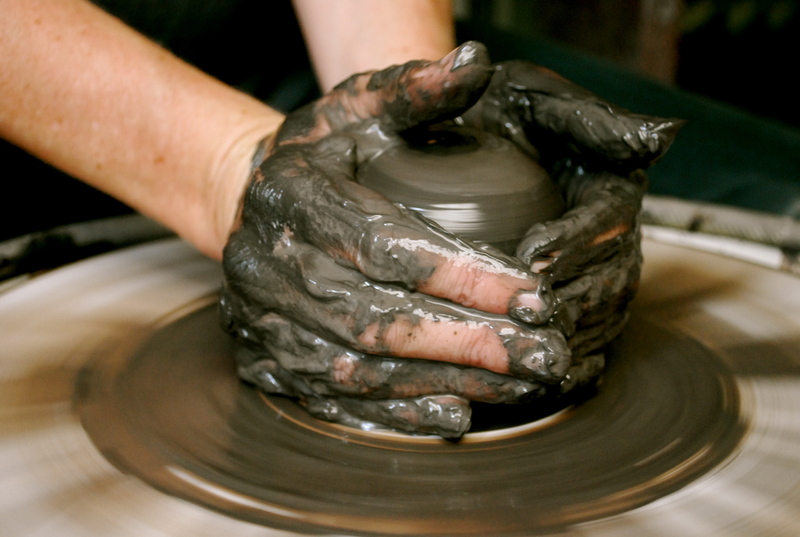 Wet clay can’t be trimmed because the piece is not strong enough to handle any pressure. A wire loop tool is needed to do the work. Trimming is done with the pots turned upside down on the wheel. Plates, tumblers, bowls, and other forms are trimmed, to show its foot/base with beauty and strength. As my student trims her bowl, I can’t help but be reminded of the “unwanted parts” of my life that has to be trimmed off. Not for them to grow back someday, but for them to be taken away permanently. A list of these things came to mind as I watch, every clay trimming fall on the splash pan of the potter’s wheel. Some of which being exercising, eating healthy food, etc. There are things in my life that have been cut off. Things I never thought I could be separated from. I know in my heart that someone bigger than me has trimmed me off from unwanted things in my life. Attachments to what should never be a part of me today. And as my creator transforms me, my real shape and form will come to life. Not turned upside down, but right side up. For the clay in me has nowhere else to go but up. Elena, the student, puts her trimmed bowls on the shelves to dry. She looks really happy and satisfied with her work, and saying, “Wow! I made those bowls with my own hands. They’re handmade!” There are two types of forming pots: the handmade way and the slip cast way. These two ways of making vessels are done in different procedures, and the value of the pots is not the same. 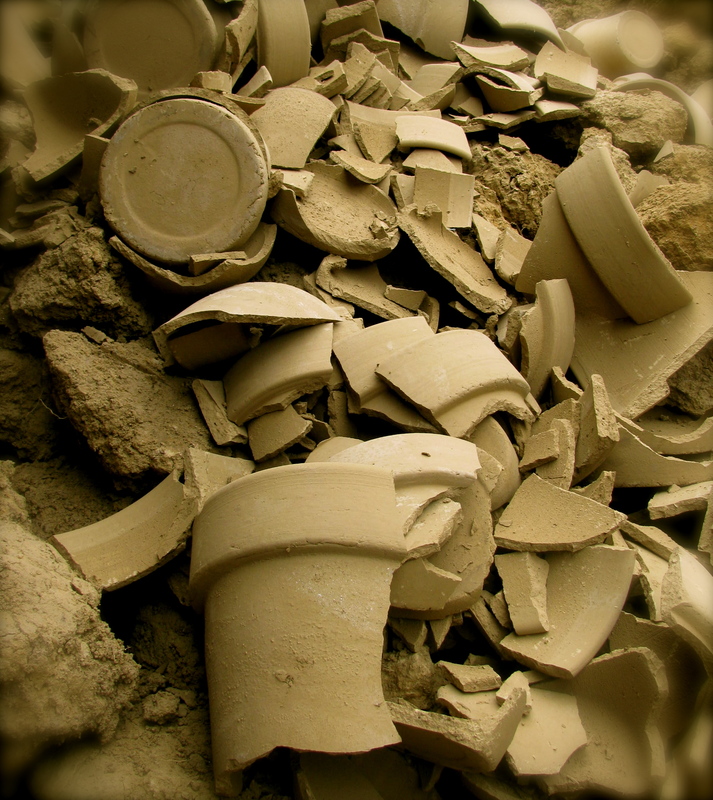 I remember a scripture that I read from the bible on Romans 9:21 “Does not the potter have the right to make out of the same lump of clay some pottery for noble purposes and some for common use?” The potter knows when to make pieces for mass production. And a potter also knows when to make creations – that are meant to be seen in an Art gallery, sitting on pedestals. And most importantly, the Creator knows, whom he has made for noble purposes and for common use. For so many years, I know that I am one that is made for common use. But as I get to know the one who made me, I realize that “common” is not something that has to be lived for the rest of my life. God himself is an extraordinary God who has extraordinary plans for his extraordinary creations. As he transforms the clay in me to have fine personal qualities, all I could do is allow him to. Trimming is done with a very sharp tool. But its sharpness is not produced to hurt, but to help take away unwanted parts, to show a vessel’s real function before it can be used. Trimming clay ministered to me again today. It never fails to encourage me that our Creator knows what he is doing to you and me. I will sleep tonight, knowing that I am a vessel in this earth not made for what is common, usual, or ordinary, but created for noble purposes. I look forward to a brand new day to form pots with my hands again. To pay close attention once more, not only to the clay that spins between by hands, but the handiwork that is being done to the clay in me.